This trip is not presently available. After Departing Orlando , we take you to Cocoa Beach. Spend some time catching some sun relaxing on beautiful Cocoa Beach. Visit Ron Jon's Surf Shop: the most famous surf shop in the world. Here you will have the full use of facilities at the Holiday Inn. Your barbecue style buffet of Chicken, Ribs, Hot Dogs, Coleslaw and fries will be served here at the resort. Next stop is the Lone Cabbage Airboat Outpost, where you will have a chance to meet and interact with some REAL Florida natives. Now by natives we mean - Panthers, snakes, alligators, possums, raccoons and for the bravest of brave we even have a skunk!! Not only will you get up close and hands on experience with these beautiful animals, but we will also have our animal experts on hand to answer any questions. Then it's time for your 45 minute 'twister' airboat ride on the St Johns river - now don't worry if it starts to get dark, all airboats are equipped with 1,000,000 candlepower search lights which as you whiz through the St Johns river reflect off the alligators eyes, giving you a view of the area not too many people experience. Board the Air Boats for a thrilling fully narrated Air Boat ride featuring 'Gators in their natural environment. 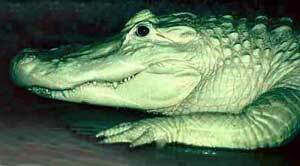 All Airboats have 1,000,000 candle power flash lamps to spot 'Gators at night where you can see them live in nature. Depart Ron Jons 5.30 p.m.